Business Bermuda has organized a business development and relationship building marketing trip in Shanghai and Beijing, China from April 14 through April 20, 2012. Led by Cheryl Packwood, CEO of Business Bermuda and joined by Wayne Furbert, Minister of Business Development and Tourism, Travis Gilbert, Director of Business Development for the Ministry of Business Development & Tourism, Christopher Buchan, Managing Director of Emerging Asset Management, and Anthony D’Silva, Managing Director of Apex Fund Services. Ms. Packwood and Minister Furbert also participated in the Chinese Enterprises Outbound Investment Conference in Beijing, which is an annual conference organized by the China Council for the Promotion of International Trade. CCPIT invited Bermuda to be a part of this conference through contacts made during Business Bermuda’s marketing tour in Hong Kong last year. This year, the conference was attended by more than 1,200 delegates representing Chinese business interests, investors, and government entities with a focus on identifying international investment opportunities for China around the globe. Business Bermuda was given an exclusive opportunity to participate in a panel discussion entitled, Invest in the Caribbean and Latin America, and presented several significant development projects in Bermuda in the Overseas Investment Project and Business Matching Seminar during the conference. Business Bermuda also signed a memorandum of understanding with CCPIT, signed by Ms. Packwood and Mr. JIA Huai, Deputy Director of Economic Information Department of CCPIT at the CEOIC Conference with the main purpose of expanding Bermuda’s trade relationship with China through exchanging information, participation in hosting and attending events, and facilitating official delegation visits to each country. Mr. SU Shulin, Governor of Fujian province known for its great number of wealthy people and successful burgeoning private sector. In both Shanghai and Beijing, Business Bermuda held press briefings for Chinese journalists to provide information about Bermuda and its international business community. This has resulted in media coverage in Chinese language media outlets and, so far, 23 syndicated news outlets that have reached at least an approximately 50 million people, Business Bermuda said. 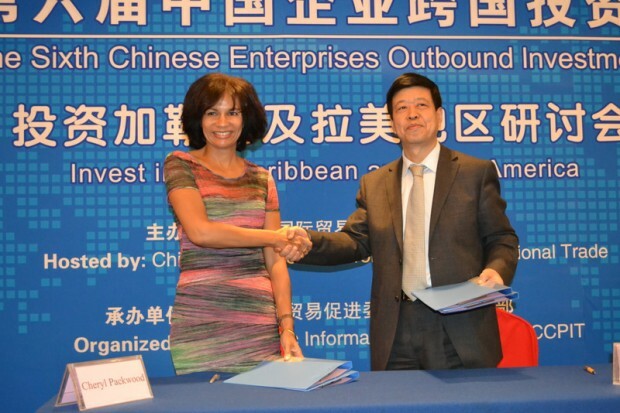 Commenting on the China meeting schedule and events in Shanghai and Beijing, Ms. Packwood said: “This has been an incredible opportunity to develop relationships and build our understanding of China and the Chinese understanding of Bermuda. “The Chinese market is very impressive and the business development opportunities are immense, but it will take time to generate meaningful, mutually beneficial business relationships. She added, “We are very pleased to have been able to further develop our ties with CCPIT. Over a year ago, we met with CCPIT in Hong Kong and through our continued dialogue over the past year, we were able to develop an understanding and secure an exclusive opportunity to participate in the CEOIC Conference in Beijing.